Virgin Holidays has implemented a multi-dimensional and immersive concept at its new v-room store at St David’s in Cardiff. 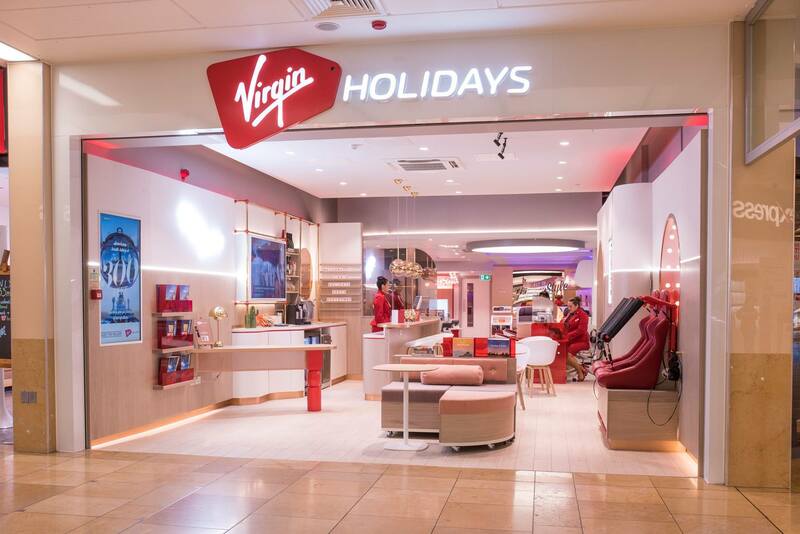 As this is the first Virgin Holidays store in Wales,YourStudio, which designed the store, wanted to push store experience to the next level. The new space creates a relaxed and inspiring environment to get customers in that ‘holiday-ready’ mood. 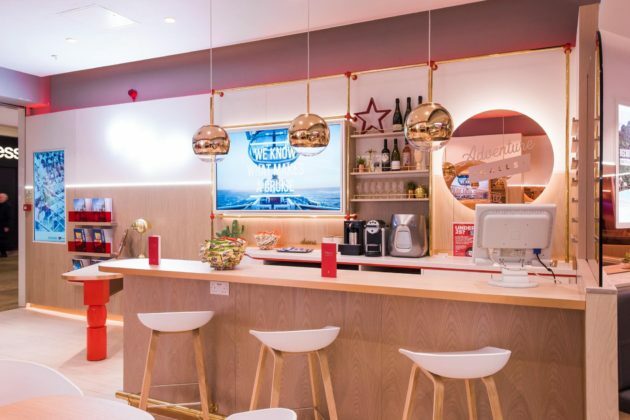 It includes a champagne and coffee bar, comfortable lounge areas and animated content to immerse shoppers in a range of destinations. 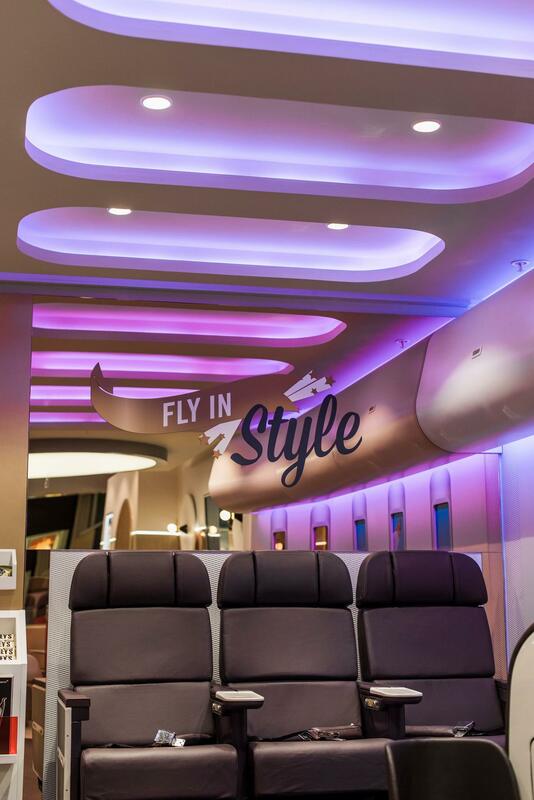 The concept was delivered by Resolution Interiors. The Virgin Holidays rollercoaster invites customers to ‘jump on board’ and experience the exhilaration of travelling around the world through a number of signature destinations on a trip they won’t forget. The latest capabilities of virtual reality takes customers loop-the-looping out of the v-room store amongst rolling hills of the beautiful English countryside, whizzing around the golden plains of African safari, diving into the pure crystal clear waters of the Caribbean, extending to the magical, infinite outer space amongst the twinkling stars, faraway planets and finally finishing off in Las Vegas. The store environment has a calm, reassuring and premium material palette mixing soft-hues with touches of rose gold and metallics. Think more inviting and lively hotel lobby than travel agent. The v-room also includes a full-size mock-up of a Virgin Atlantic cabin, including Premium Economy and Upper Class seats that customers can ‘try before you buy’, alongside a full snack bar with magazines. A family friendly area with kids ‘hang out’ space makes sure children have just as much fun in store as shoppers do. 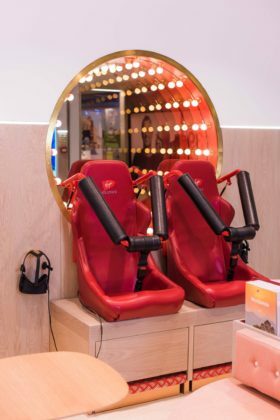 Designed to deliver the ultimate customer experience, the new store provides space to connect, discover, relax and engage in comfort. The lounge area with wellbeing lighting encourages the move away from traditional sales desks, promoting a sense of welcoming informality.